Earlier this week I went to a presentation by the HRWC of all the work the volunteers did this summer. The data I gathered along with the data from over 100 volunteers was compiled into a 90 minute power point presentation. This presentation took all the pictures, water samples, temp readings, bug collections and water flow measurements and put it into something I could understand. The main thing I took form this is that the whole watershed is given a score from 1 to 100. A score of 1 is basically the bottom of a port a john where as 100 is perfectly pristine. The watershed as a whole had an average score of 67, with one section up by White Lake scoring a 93. As for Wood Creek the overall score was a 66 which is extremely close to the river average. Not bad but their were a few bright points and some areas for concern. Phosphorus levels were above the accepted number but not by much. Anyone who fishes in my world knows what high phosphorus levels leads too…Algal blooms. Granted they won’t be as bad as the blooms in western Lake Erie but any bloom is a bad one. One other item of concern that bothered me was in relation to the fish, specifically Steelhead. Years ago adult Steelhead were seen trying to spawn in Wood Creek. A DNR electroshocking survey failed to locate any young of the year fish. That still doesn’t mean that there wasn’t a hatch but it is highly unlikely. One thing I did find out was that there is a dam .6 miles upstream from the mouth. This dam is blocking the steelhead from being able to swim farther upstream to more suitable habitat. Maybe someday the Dam will be removed. This data will be used to help make the case for removing the dam along with other improvements throughout the whole watershed. Hopefully the improvements will happen. Overall it was an interesting experience that I will do again. I’m sure they will contact me again to help out and hopefully a different stream. This is going to be a right to the point report. Vital stats, results, and that’s it. With the weather report for the rest of the week this will probably be my last trip of the year. The wind had been howling from the west the last few days but it was starting to die down. I saw this as my only opportunity so I jumped on it. Normally winds gusting to 25 mph is a good reason to stay home but this was going to be my only opportunity to fish and I needed to get some more walleye in the freezer. I launched at Rotary Park shortly after 3:00 pm and by 3:30 I was lines down by the blue boat house. The wind made boat control almost impossible so I moved farther upstream hoping the shoreline would help block the wind. It helped some but keeping my boat under control was going to need constant attention. I started with a #9 Clown and #11 Bleeding Blue Shad and a Smithwick Rattlin’ Rouge. Something with rattles for the dirty water, the lure that has been working so well for everyone I know the last 2 weeks and another just for the heck of it. Turns out all 3 caught fish with the Clown catching the largest fish. The surface temp was 47 degrees and the visibility was between 1 and 2 feet. Absolutely no weeds, just an occasional leaf floating on the surface. Winds were out of the west and anywhere from 10 to 25 mph, but most of the time they were around 10 mph. All in all it was a pretty good trip. I was only out there for 90 minutes, I didn’t lose any lures and I ended up with another limit. Boat control was difficult but not impossible. When the wind is like this I purposely fish alone just to keep the extra lines from tangling up. I learned that one the hard way. One final note. This is for all those hypocrits that preach how they let all the females go and only keep the small eaters. The 18 incher at the bottom of the picture? Yep female. 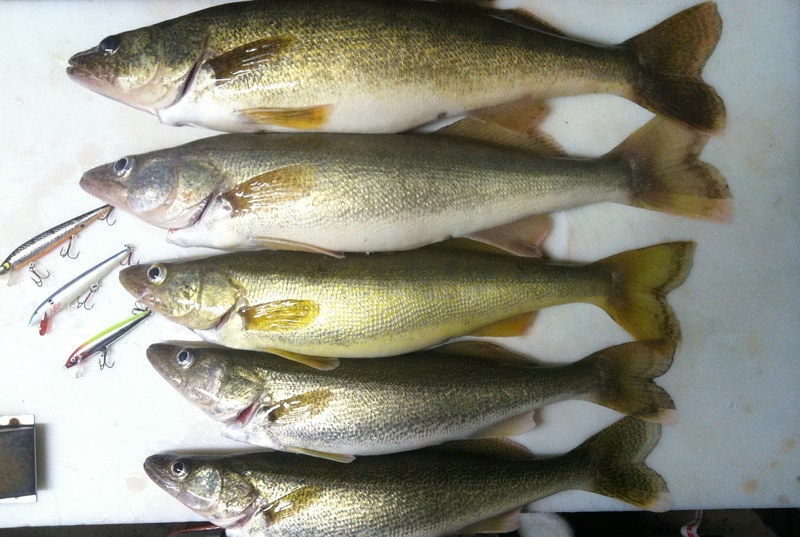 Just goes to show you that any size fish can be a female and you preachers can’t convince me for one second that you have never kept a female walleye.